To make sauce: In small bowl stir mayonnaise, ketchup, mustard, Sriracha and dill pickle. Build a fire in an outdoor grill for direct cooking over high (500ºF) heat. Place patties on grill and cover grill. Grill patties for 13 to 15 minutes, turning once, for medium-well burgers. If flare-ups occur, move patties to an area of grill not over heat source. During last 30 seconds to 1 minute, toast buns, cut sides down, over direct heat. Remove from grill. Season burgers with salt and pepper as desired. Build burgers with sauce and lettuce and serve. Slice tenderloin and divide equally; arrange slices on top of salads. Drizzle dressing over salad and garnish with cilantro. 1Use purchased blend or combine 1 tablespoon chili powder, 1 teaspoon cumin and 1 teaspoon oregano. 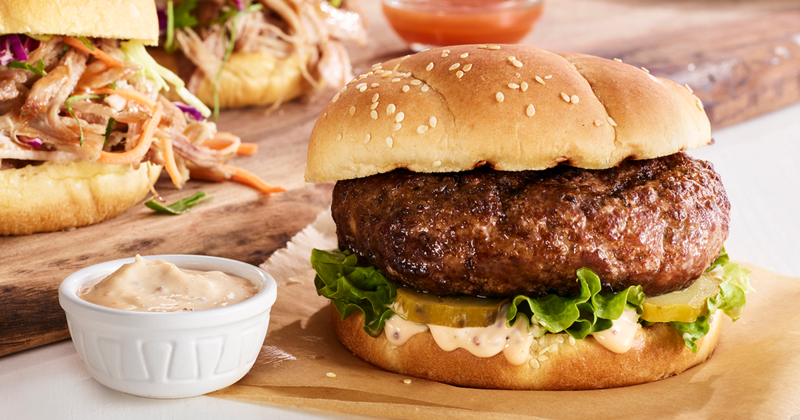 Serving Suggestions: Serve the burgers with a salad of marinated sliced tomatoes, sweet onions and fresh dill. The tomatoes and onions can also be added to the burgers as toppings.